ONE of the leading scientists of America, Dr. Joseph Leidy, LL.D. of the University of Pennsylvania, surprised the thinking world in 1889 by coming forward publicly as a supporter of the inventor of the famous "Keely Motor". Coming from a scientist of such repute, these words caused a considerable sensation in both financial and scientific quarters. Previous to this announcement, for upwards of twenty years a completely unknown man, John Worrell Keely of Philadelphia, had been working patiently and secretly to demonstrate that he had discovered a new force in nature that would eclipse electricity and all other known mechanical forces. An extremely big order, all must admit. Keely had been working on his idea long before scientists had begun to discuss the probability of "bursting the atom" to release the enormous force contained in it, which experiment has in recent years been partially carried out by scientists in England, Germany and America during 1932-33. Plastic and vast, one intellectual breeze. At once the soul of each and God of all ?" 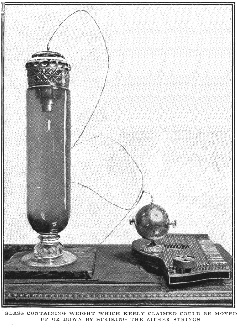 From this moment Keely turned his attention to etheric vibration and the flow of the magnetic current of the earth from pole to pole, with the astonishing result that he so perfected a motor to make use of these forces that between 1889 and 1890 he was in a position to show to scientists, in his laboratory in Philadelphia, a machine that ran by some mysterious power, or to quote the words of Dr. Leidy, "he demonstrated the discovery of a force previously unknown to science." One might have imagined that such an extraordinary discovery would have been hailed by scientists and the press as great a revolution as that caused by the steam engine and later by the production of electricity. The contrary was, however, the case. Nearly all men of science, with a few exceptions, together with the press, ridiculed the idea as impossible, and did not hesitate to call Keely a charlatan and a fraud. Prejudice against the unfortunate inventor ran so high that whatever financial sources he had became dried up, and for some years he was often reduced to the point of starvation. Whatever help or encouragement he received during this period came from two women, who perhaps in their intuition, foresaw the possibilities of such a discovery long before it could penetrate the more dense minds of men. One of these ladies, Mrs. Bloomfield Moore of Philadelphia, suffered cruelly for her loyalty and generosity to the inventor. Some of her relations attempted in the Courts to prove her insane. An injunction was obtained against her making use of her property, and she was in the end reduced to almost a state of complete limitation. It was at her house in London that I first heard of the "Keely Motor". 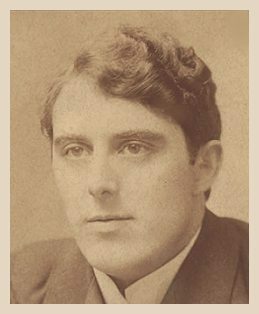 Sitting next me at the luncheon table was the well-known scientific engineer, Major J. Ricarde Seaver, a man well known in London circles who for services rendered in some engineering project had been made a "grandee" of Spain. The conversation had turned on the prospects of the "Keely Motor," a subject that on account of hostile criticism about the same time in the press was being much discussed. "I have only heard of John Keely's discoveries in the press. All projectors of new ideas are at first subjected to calumny, criticism and ridicule. James Watts, the inventor of the steam engine, took over thirty years to develop his plans. In the meantime he was often laughed at. "When the idea was first mooted of running an electric cable to America, it was considered absurd. It is the same with many other inventions that in the end prove of use and benefit to humanity. "Judging from articles I have read, Mr. Keely has demonstrated to many eminent men his neutralizing or overcoming of the law of gravity and the separation of metallic plates by a new means of employing the Law of Vibration. 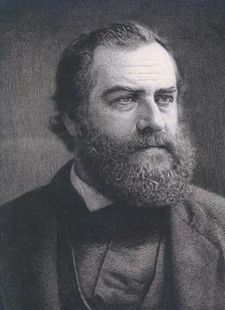 Such men as Dr. Joseph Leidy of the University of Philadelphia and Dr. James M. Wilcox, the author of "Elemental Philosophy" have testified that they have witnessed Keely's experiments and were satisfied that he has made manifest the existence of some, up to now, unknown power that cannot be explained by ordinary physical laws. "The opinions of such men cannot be lightly thrown aside. I only wish that the opportunity may some day come my way to be sent to Philadelphia to investigate Keely's discoveries myself." As Major Seaver had only met Mrs. Bloomfield-Moore for the first time that day, he was later surprised to hear that our hostess had for years been deeply interested in the progress of the "Keely Motor". Six months later, Major Seaver dropped in to see me in my rooms in New York City. "Yes," he said, as he held out his hand, "my wish became realized. Barnato Brothers, the firm to which I am advisory engineer, have sent me over to investigate and report on the 'Keely Motor.' I am going to Philadelphia tomorrow and I propose that you come with me. Give yourself a holiday for a few days and come along." The next day found Major Seaver and myself on the train together. During the journey I got the Major to tell me something of his plans. "I have no preconceived ideas about Keely, one way or the other," he said. "I am just going with an open mind commissioned to report to my employers if there is any commercial possibilities in his 'Motor.' Its supposed weak point is, that it can only be set in motion by Keely striking a chord of vibration on a violin, which is the key to unlock a similiar vibration in the machine. If this is really the case, then a man of Keely's attainments may any day invent an instrument to take the place of the violin, and if such a thing should happen, it would be worth while for such a firm as Barnato Brothers to pay many millions of pounds to have an interest in such an epoch-making discovery." The next morning Major Seaver presented his credentials at Keely's workshop. The inventor received us without any formality. He was in fact in his shirt-sleeves and did not even make a pretence of putting on his coat. He was a most unassuming man, very simple and direct in his words and expressions. He had no pretensions of being taken for an engineer or a scientist or anything out of the way. In answer to one of Major Seaver's questions as to what had first led him to believe that an, up to then, unknown force existed beyond the power of steam and electricity, he very simply said, "The idea came into my mind from where I cannot tell. Perhaps it first came from a craze I had to study the magnet to attempt to solve what the mysterious power was that enabled it to attract steel and iron to itself. "For a long time I wondered over the indisputable fact that a horseshoe of iron could be magnetized in a few seconds by the current of a few amperes from a battery, and that such a magnet could lift many pounds weight of metal. Further, that every second of time without end while the magnet is expanding energy it totals up an almost inconceivable amount of actual power, not alone that, but the magnet of one pound lifting power today, may and in fact will be stronger tomorrow. "Where does this really tremendous amount of energy come from? By what inscrutable process does the mere magnetization of a bar of iron make of it a machine for the transformation of energy, even more, a perpetual creator of force? "It came into my mind that there was a hidden process going on of some kind, energy going into the magnet and flowing out of it all the time it was doing work energy in some form. "Where did it come from "” gravity? atmosphere? solar rays? earth currents? Who can say? "The mere fact of the magnet carrying its load proves conclusively the constant flow or positive action of a sympathetic force, the velocity exceeding millions of vibrations per second. "In the course of many years of experiments, I believe I have discovered a means of harnessing what may be called 'etheric' force and of overcoming gravity. "I want you, Sir," Keely went on, turning to Major Seaver, "to examine my machines from the standpoint of the sceptic. Calumny has asserted that I have them connected by a hollow steel wire by which I employ compressed air. "I want you to satisfy yourself especially on this point. You are entitled to lift the motor off the bench, to place it where you like and it will still function. "The first demonstration I will give you is that of starting the motor by a note of music, otherwise vibration. I want you to do this yourself. You will take this violin, pass the bow across the strings. At first you may not succeed, but you will eventually." Major Seaver took the violin. He was fully ten feet away from the machine he was supposed to start. For fully five minutes he tried note after note, but nothing happened. He handed the violin over to Keely. Perhaps it was due to his long years of practice, or it may have been owing to his unusually keen musical hearing, but the fact remained that in one stroke of the bow an immediate response was heard in the machine. The buzz from it grew louder every second until its speed became so great that, although bolted firmly on the bench, it rocked the whole place. "Can you stop it?" Seaver asked. For answer Keely drew a discordant note from the violin. The machine immediately began to slow down and finally stopped. "Now, Major," Keely said, "you should be able to start it up yourself. Be patient, try tone after tone and chord after chord. Sooner or later you must strike the right one." Major Seaver, with a very patient look on his face, again took the violin. This time he drew longer notes from the instrument. Suddenly an answering buzz was heard in the machine. It started off as before, its speed rapidly increasing every moment. Again the Major lifted the violin. He drew a sharp discord from the strings. Instantly the motor slowed down and became silent again. "Remarkable," was all Seaver said. Then, taking up a wrench lying near at hand, he very deliberately undid the bolts and lifted the motor off the bench. As no connecting wires of any kind were to be seen he rebolted the machine and handing me the violin, told me to try. Perhaps it was what is called "beginners' luck." I had barely drawn a sharp clear note from the "A" string, when again the motor started. This time the "stopping" was the difficult part. Though I struck discord after discord, still the motor went on rapidly increasing its velocity. I appealed to Keely to help me. He took the violin, struck one discord and immediately the motor slowed down and stopped as before. "That is the one weak point that up to now prevents its commercial value," Keely said. "My efforts now are being concentrated to make an instrument that will give off an exact note to start and stop the machine at will. The difficulty is not an easy one to get over owing to the variation in the magnetic and etheric currents which are changing continually, but I believe that one of these days I will get the inspiration how to solve the problem." Keely next showed us his revolving globe of glass that had caused much comment in hostile newspapers. It was of very simple construction, merely a large glass globe balanced on a pivot of platinum that, when spinning, kept its equilibrium by centrifugal action exactly as a boy's top keeps itself in position by the same law. This globe was also started by a vibration from the violin. When it had attained considerable velocity, Keely made me lift it off the table and carry the whole thing, wooden stand and all, several times round the room. As its revolutions became more and more rapid I grew alarmed, believing it might any moment fly to pieces. Again a discord from the violin and in a few minutes it stopped. The next day Keely showed Major Seaver and myself another of his inventions equally startling. It was nothing more or less than a means of overcoming the law of gravitation as applied to airships. Before going into this demonstration the inventor showed us a remarkable experiment in connection with this idea. Three glass chambers, forty inches in height, filled with water, were placed on a slab of glass. In each of these cylinders were three metal spheres weighing six ounces each. When a wire composed of silver and platina connected these glass chambers with the sympathic transmitter, the metal spheres rose or descended in them or remained stationary at any point with a motion as gentle as that of a thistledown floating in air. In demonstrating what appeared to be the overcoming of gravity for aerial navigation, Mr. Keely next showed us a model of an air-ship weighing about eight pounds. When the differential wire was attached to it, it also rose floated, or remained stationary, at whatever height he wished it to be. This remarkable demonstration of this model air-ship, it must be remembered, was shown us at the Keely Laboratories in 1890, some thirteen years before the brothers, Orville and Wilbur Wright, flew the first aeroplane in (Carolina in 1903 and the Brazilian Dumont flew) in France in 1906. In spite of this, this really great inventor, or as Keely preferred to be called, "discoverer," was no nearer to financial success than before. Major Seaver had to report to his company, Barnato Brothers of London, that until the moment arrived when Keely produced a mechanical device to take the place of his violin there could be no prospect of success of "the Keely Motor," from a commercial point of view. And so things went on until Mrs. Bloomfield Moore, under opposition from her family, could no longer remain as Keely's backer. Bills and writs for money came pouring in on the inventor's head, the press lost patience, papers denounced "the Keely Motor" as a failure and Keely as "one of the greatest swindlers that ever lived." See Was Keely a Fraud? Perhaps it is that inventors, like poets, painters and writers, belong to an unusually sensitive class. They can only create by being encouraged in their visions and dreams. So few realize that "dreams" have been so often the forerunners of reality that it is to "dreamers" that the world owes so much. Poor Keely became literally hounded to death by the press, under-paid reporters in search of copy made "wonderful revelations," editors in easy chairs wrote sarcastic comments. "Man's inhumanity to man" crushed one more over-sensitive soul, and so a great discovery became lost, at least for the time being. Copy of final report of the investigations of W. Lascelles-Scott of the Physical and Chemical Laboratories, Forest Gate, England.